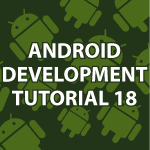 Welcome to part 18 of my Android Development Tutorial. Over the course of the next few tutorials I will focus on a bunch of new topics as well as provide a review of topics people are struggling with. This tutorial covers how to create custom icons for our app. We then build an app based around the use of fragments. We will be building an app that a Census taker would use to gather information on people. The tutorial starts slow, but it will build quickly. All of the code can be found below. or remove from another Activity. // This method is called when the Fragment is called for. // We initialize everything here. // to add the inflated view to the parent. // We mark this false because the Activity will add the view. Could you provide a PNG file? What do you want a PNG of? Your vidoes are just awsome! after watching them, I’m actually thinking of taking up Android Development as a full time job. Got a question- Is there any way I can hard code a Json/Rest reponse in an android project. The reason I want to do this is because the Webservices are not ready yet and I want to make a Demo app which uses values from a Json object returned on a GET Http response. So I was thinking, like to create a class which returns Json Object with bunch of mock values. Is it possible? Anyway you can show a simple example of it?? Again, Thanks a Lot for these amazing video posts. Take care! Thank you 🙂 I’m glad you are enjoying them. Android is awesome! Sorry to bother you, but my question is irrelevant to this video. I’m wondering if you can show me how to move an object in a doubly linked list to the front/end. Thanks! Nvm, I figured it out! I’m glad you got it. Sorry I couldn’t get to you quicker. Hi, again my question is irrelevant to this video. I’m wondering if you can show me how to write a class for converting infix to postfix. Thanks! This is a very clear algorithm for the converter and is very helpful! However, while writing my actual code, I have got a problem about my own stack (can’t use built-in stack in java). The operator that is scanned from a String (i.e, ‘+’ in the String ‘a+b’) has a type of ‘char’, how do I put it into my stack? I’m kinda a beginner here, sorry about any of the incorrect terms. Thanks for your help! Nvm, I just found out all I have to do is type “Character” instead of “char” in the . Thanks for your help again! I guess my next question would be how to create a proper stack for this specific converter? Nvm, figured it out! But I have a new problem now. How do I add a “pop-out” item from the stack to my postfix String? I typed “postfix += stack.pop();” in my code, but it didn’t add the “pop-out” item to the postfix string. Thanks! Nvm, figured it out! Thanks! Sorry I couldn’t get to you quicker, but I’m glad you figured it out! I covered how to Install Eclipse for Java here. I then show how to Install Android Development tools. Hey Derek, I’ve been searching for Android tutorials from scratch(basic) to professional on Youtube and found out your channel as the BEST. Can you please help me from which video i should start with and which to end. Thank you 🙂 It is now best to skip the install videos at the beginning and instead watch my new ADT installation video. Then decide if you want to start off making Android apps in an easier, but some what limiting way with my App Inventor video tutorial. If you want to make complex Android apps right now you’ll need to know Java first. Here is a Java tutorial (Parts 1 – 18, minus 8 and 10 is enough). Then you’ll need the Android video tutorial. So, you mean to say the Android videos(1-26) with your Java tutorial is more than enough? They will definitely teach a lot. I still need to do more tutorials on Android and I will over the rest of this year. Wonderful and very useful tutorials. Can you provide links to download the source code? for this series? These videos are base of my app i am trying to complete. one thing i would like to request is that before you start writing code in videos if you can explain how many files will be in app and what purpose they will server. a slide that explain that will ge good enough for me to easily understand how many files i need in my app and for what purpose. It is already explained but really a slide explaining that will be great help. Thank you helping us to learn android. Thank you I’ll see what I can do.